Mix & match to your heart's delight. Eika is a local swimwear brand that breaks the norm by offering bikini sets that you can mix and match to your heart's delight. Founded in the heat of summer 2014, Eika features one of a kind designs for tops and bottoms-Perfect for any body type! Inspired by sand, waves and the brand's existing imagery, we wanted to bottle up the feeling of being out on the beach, not a care in the world. Knowing that their online presence is a big part of building their audience, we made it a point to make sure that the branding will look good when applied to their existing website as well as their social media feeds. 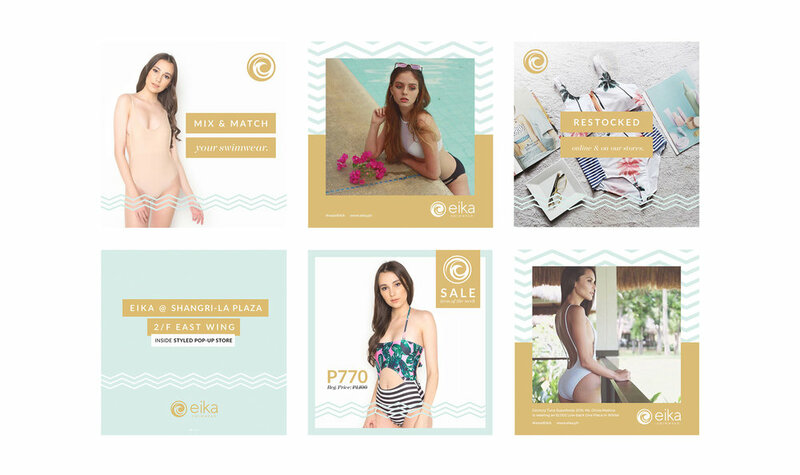 Using the Brand Guidelines and templates we provided, Erika Rodica, the owner of Eika, was able to easily create collaterals for the brand's "Bikini Mix Party". The collaterals were all consistent with the look and feel of the new Eika branding. You can visit Eika Swimwear's branches and stockists at BF Ruins Paranaque City, Nothing But H20 Alabang Town Center, Torre De Santo Tomas Espana, Vista mall Taguig, Hanniel Square Pampanga & Nothing But H20 Boracay.